An eminent international line up of experts in law, political science, economics and history examine the dynamics of the European Union's (EU) development as a collective member of the G8 and G20. Each contribution provides a methodical and much needed insight into the external and internal factors influencing this evolvement process, the options for these institutions to reform and collaborate and the future role of the EU in this new system of institutions. Part One makes an introduction into the topic of the EU representation in the G8 and the main concepts explored in the book. Part Two presents an analytical framework for exploring the EU actorness in global governance institutions. Part Three examines the transformation of the G7/G8 system, the emergence of the G20 as a leader's forum and the EU role in the process. Part Four provides an in-depth analysis of the EU contribution to critical cases of global governance including issues of energy, finance, development, peace and security. Part Five analyses the main trends in leadership and models of engagement. Contributing to key contemporary debates, this book is a lucid replenishment to the existing literature on global governance and an excellent resource to studying the EU's role as a global actor. 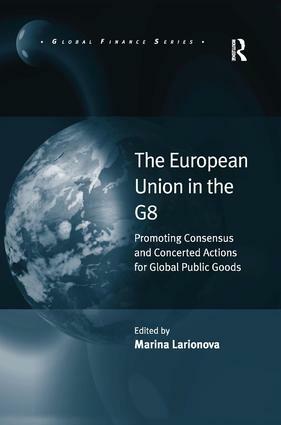 Contents: Preface; Part I Introduction: The European Union as a global player: creating global public goods through partnerships and multilateral institutions, Marina Larionova. Part II The Analytical Paradigm: The concept and definition of global public goods, Sergey Medvedev and Igor Tomashov; Key concepts for exploring the role of the European Union in the G8, John J. Kirton. Part III The Key Players: The G7/G9 system, John J. Kirton; The future role and reform of the G8, Peter I. Hajnal and Victoria Panova; The European Union as a leading international player, Mark Entin; The representation of the European Union in the G8, Judith Huigens and Arne Niemann; The European Union in the G20, Marina Larionova and Thomas Renard. Part IV Critical Case Studies: The G8, the European Union, climate change and energy, John J. Kirton and Victoria Panova; G8 and G20 financial crisis governance: the European Union contribution, John J. Kirton; The European Union's development policy in the context of the G8, Vitaliy Kartamyshev; Security as a global public good: common issues for the European Union and the G8, Sergey Medvedev and Igor Tomashov; Knowledge and education as global public goods, Sergey Medvedev and Igor Tomashov. Part V Trends in Leadership and Models of Engagement: The European Union as a model for global governance, Vladimir Zuev; The European Union and the G8: priorities, functions, values, Marina Larionova and Mark Rakhmangulov; Index. Marina Larionova is Doctor of Political Science, Head of the International Organisations Research Institute (HSE IORI), Head of International Programmes at the National Training Foundation, Moscow, Russia.